NAYPYITAW—Myanmar held its first-ever international investment summit late last month in Naypyitaw. The two-day event showcased 120 projects worth US$3 billion (about 4.5 trillion kyats) in 10 states and regions. On the second day of the event, Investment and Foreign Economic Relations Minister U Thaung Tun hosted a dialogue for international guests, offering them reasons why they should invest in Southeast Asia’s “Final Best Frontier.” The government is looking for ways to revive the economy, which has been sluggish for more than two years. “Myanmar is now open for businesses. We are making the necessary changes,” U Thaung Tun said. A weakening currency, high inflation, armed conflict, unstable policies and the slow pace of reform have chipped away at growth under the current administration, which had hoped the economy would take wing after more than five decades of isolation under military rule. Under the government’s “Look East” policy, officials have toured Asia beating the drum for the country’s economy. The summit was part of this attempt to raise investment from East Asian countries. More than 1,600 local and foreign delegates from 17 countries attended the summit and 40 companies exhibited. The top countries were China, Japan, Singapore and Thailand. Here are four takeaways from the minister’s conversation with investors. U Thaung Tun listed some of the major reforms undertaken by the government so far—such as revision of the legal framework, removing procedural bottlenecks and launching online company registration—with the aim of making Myanmar a more attractive FDI destination. He assured the investors that there are two major reforms—standard operation procedures, which will provide a smooth step-by-step process for investors, and a single window system, which is a trade facilitation system to increase time and cost efficiency for traders in their dealings with government authorities while obtaining the relevant clearance and permits. The Myanmar government is working to introduce a “Land Bank,” a digital platform that aims to provide investors with information on how much land is available and also about land leases. “There will be more transparency. 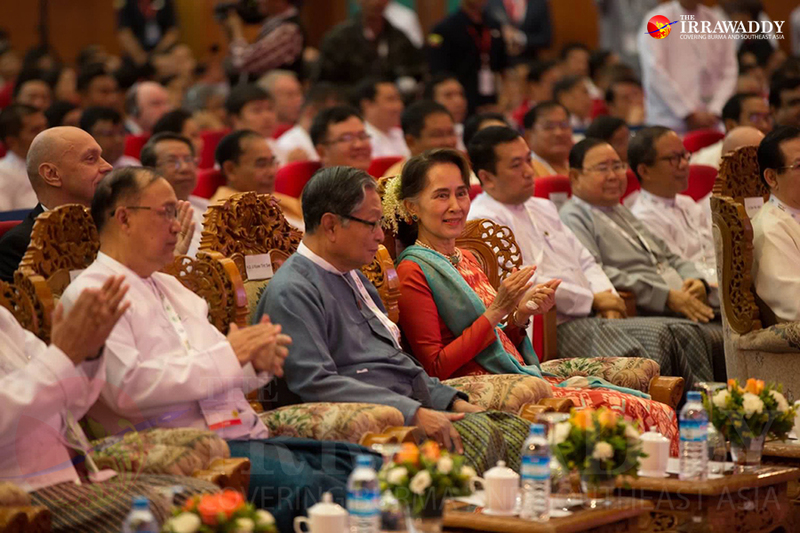 I think it creates a level playing field for those who want to invest in Myanmar,” he said. U Thaung Tun mentioned a recent Central Bank of Myanmar move that grants permission to foreign companies wishing to operate businesses offering life and non-life insurance in Myanmar. Last year, the government launched the Myanmar Investment Promotion Plan (MIPP) to attract more than US$200 billion in sustainable, responsible and quality business over the next 20 years. The official said this year’s priority was to focus on MIPP; however the World Bank’s focus said economic growth is expected to slow from 6.8 percent in 2017-18 to 6.2 percent in 2018-19. U Thaung Tun emphasized that the government’s focus this year is on expanding investment and taking quicker steps to open up the economy. “We are not just leapfrogging; we’re gonna take a quantum leap,” he said. According to Global Infrastructure Outlook’s report, Myanmar’s positive economic trajectory will be challenged by its massive infrastructure need—among the 50 nations, Myanmar is listed as the worst. The country needs an estimated $112 billion worth of infrastructure. The minister stressed to the audience the rise of China should not be seen as an obstacle, as he believes all countries can benefit from BRI projects. His government signed in September an agreement to implement the 1,700-kilometer-long China-Myanmar Economic Corridor, which will start in China’s Yunnan Province and go through Myanmar’s major economic cities—Mandalay in central Myanmar and the commercial capital of Yangon—and reach the coast at the Kyaukphyu SEZ in Rakhine State. “We can do cooperation rather than confrontation. It will help development not just in the region but also to the world,” he said. He said that Myanmar could be a transport hub for Asia under the BRI agreement. Critics warn that the Rohingya crisis and condemnation from the West over what has happened in Rakhine State have pushed Myanmar back into the hands of the Chinese, despite public wariness surrounding Chinese investments in the country. He cited as one example Myanmar’s working with China on the Kyaukphyu SEZ, which offers China access to the Bay of Bengal while enhancing its regional connectivity as part of Beijing’s Belt and Road Initiative (BRI). Another example was Kaladan Multi-Model Transit Transport Project with India, which aims to open sea and land routes linking eastern India’s seaport in Kolkata with its landlocked state of Mizoram through Myanmar’s Rakhine and Chin states. “All of us work together for all the people. So, whether it is China, India, Bangladesh, or Thailand, we need to work together,” he said. The NLD government has implemented some major economic reforms. However, following the news of the 2017 Rohingya crisis, which badly tarnished the country’s image, foreign investment has significantly declined and Western investors have grown increasingly cautious of Myanmar. Rakhine has become a problem when it comes to securing foreign investment. U Thaung Tun tried to reassure global investors that the Myanmar government is trying to find solutions that will be acceptable to all. He said the government has been implementing the recommendations in the report by the Advisory Commission on Rakhine State chaired by the late Kofi Annan. “We need to find a sustainable solution, not a short term solution, so peace will prevail, and communities can live together peacefully and in harmony,” he said. He said there are a lot of undocumented people living there, adding that there is poverty and a lack of jobs, and that the country needs to address all the issues. The country cannot accept terrorism, he added. “That’s why I’m telling the international community to work together [with Myanmar] to find a sustainable solution to create jobs,” he stressed. He said the government plans to hold an investment summit in Rakhine on Feb. 21-22 focusing on three major sectors—agriculture, livestock and fisheries; tourism; and SMEs. Focusing on issues that are negative is not going to solve the problems; it will only aggravate the situation in Rakhine, he said. All parties need to work together to develop Rakhine State, he said.